Are you looking for Last Date to file Income Tax Return, Service Tax, TDS, PF (Provident Fund), ESIC and 16 A form? 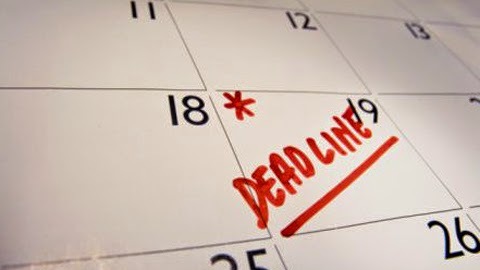 Here is complete list of Due Dates, Last dates of filling all financial statements in india. Income Tax department has released all notification regarding last date with due payment for filling Income Tax Return, TDS, Service Tax, PF, ESIC and 16A form. Since it is mandatory to file Income tax return in India, as mentioned in Black Money Bill, Here is last dates list of income tax return, tds, service tax etc. 1. Last Date to File Income Tax Return Assessment Year 2015-16 is 31st August, 2016. As every year, there is no change in last date of filling Income tax return for upcoming assessment year 2016-17. You can file on or before 31st july 2016 your income tax return. There is no change in last date or due date though, there is some modification in ITR Form, now onwards, you need to show how many foreign trip you did in financial year in your ITR Form. Check out Changes in new Income Tax Return Form. 2. Last Date to Deposit TDS Deducted in March, 2016 is 30th April, 2016. If your TDS was deducted in March, 2016 you can fill 15A form on or before 30th April, 2016. Earlier last date was 7h April, which was extended to 30th April, 2016. All the employee (whose TDS deducted at source should must file before 30th april, 2016. Check out>> 4 Ways to Save TDS on Fixed Deposit. 3. Last Date to file Service Tax Return for october, 2015 to March,2016 is 25th April, 2016. 4. Due Date for Provident Fund Payment for March, 2016 is 15th April, 2016. 5. Due Date for ESIC Payment for March, 2015 is 21st April, 2016. 6. Due Date for TCS (Tax collection at Source) is 7th April, 2016. 7. Due Date for ETDS Return (27EQ) is 15th May, 2016 (Rule 31AA). 8. Due Date for TCS Certificate 27D is 30th May, 2016. (income tax rule 37D). 9. Due Date for E TDS return Salary Q4 (01.01.2016 to 31.03.2016) (Form 24 Q) is 15th May, 2016. 10. Due Date for ETDS return Other than salary Q4 (01.01.2016 to 31.03.2016)(26Q) is 15th May, 2016. 11. Due date for Form 16A quarter four (01.01.2016 to 31.03.2016) is 30th May, 2016. 12. Due date for Form 16 (salary) Financial year 2015-16 is 31st May, 2016. 13. The date for filing ITR-V for returns e-Filed for A.Y 2014-15 (filed on or after 1st April 2015 till 31st March 2016) and for A.Y 2015-16 (filed on or after 1st April 2015 till 30th June 2016) extended till 31st October 2016. These are due date or last date to file or fill financial forms as per income tax department of india. for more updates on finance, keep visiting us, thank you.